There’s always drama during a wedding – whether it’s the caterer, the limo, or something else entirely, drama of some sort is a guarantee on your big day. Heck, they even make reality shows about it. But what if the drama came in the form of something sweet and gorgeous – like this wedding cake with black fondant. Look at this beauty! How often have you seen a black wedding cake? Sure we’ve featured black and white cakes here in the past, but nothing like this stunner. This cake is elegant and sophisticated, and it’ll wow your guests. The three-tier cake would be perfect at your formal wedding, regardless of the time of year. Think of it as a black-tie cake. 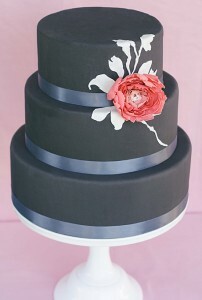 I love the addition of satin ribbons around the tiers and the pop of color from the brightly hued flower. This is definitely the kind of drama you want to add at your wedding. This cake can be seen here. Cake created by Erica O’Brien Cake Design.